Break the chain- what chain? Buying a house has a certain sense of inevitability to it. You find a house you like, you put in an offer, your offer gets accepted. Meanwhile your house it on the market, you get an offer and you accept it. In a perfect world that would be it – job done. However, there’s a lot more to it than just offers and acceptances. There are the estate agents, the valuations and the viewings. Not to mention keeping your house clean and tidy for as long as it takes. The solicitors to instruct, the surveyors and energy performance certificates and, of course, when everything is set and agreed you find yourself part of a chain. How did you get into the property industry? By accident really. I trained as a bricklayer for a short while after leaving school but didn’t enjoy working on site in cold and wet conditions! I lived with my parents at the time, they were moving house and I showed one of the estate agents around. I thought that seemed like a great job and applied to join a well-known independent chain. I spent 25 years in estate agency working through the ranks from trainee negotiator through to Regional Director. Then I moved across to the Corporate Sales division of the Spicerhaart group about 10 years ago where part of my remit is responsibility for the part exchange and assisted move division that looks after our developer clients. Will the government’s latest plans ‘fix’ the UKs housing shortage? Looking at the latest housing supply figures it was encouraging to see that, although the net additional figure may still be below the peak in 2007-08, it was still the second highest in 25 years, and up 15% on last year. There were of course a few contributing factors to the increase in new build, including government schemes such as help-to-buy and the relaxation in planning regulations. New build has become more popular across the board, not just for first-time-buyers and second steppers, but also for the older generation downsizing. Schemes, such as part exchange, have also made new build more attractive. Part exchange in particular makes the process much quicker and in many cases less stressful and ultimately less expensive. Six months to sell a house, in this day and age? According to recent research by Housesimple.com an average of 12.5 per cent of properties currently on the market have been for sale for six months or longer. Given that we are in a situation where even the government recognises that the UK has a desperate shortage of housing, this percentage seems hard to understand. Of course, this is an average and there are various reasons why some properties are less attractive to buyers. Location and state of repair are factors, but in reality, not particularly significant in the grander scheme. Even in the City of Westminster, a most desirable location, the percentage of properties on the market for six months or more has reached 22.5 per cent of the total for sale. Assisted move schemes are a growing option for retired people looking to downsize. McCarthy & Stone recently reported that almost half of all pensioners are considering moving to a smaller home. Increasingly older people are choosing either new build properties or sheltered accommodation as their downsizing option as it means they will have little or no decoration or maintenance for some years. 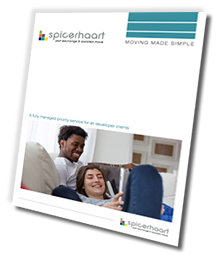 Spicerhaart Part Exchange and Assisted Move has seen a big increase in the past year of people using a property assisted move arrangement to help them to move, giving people the opportunity to sell their property quickly, with minimum hassle and cost.